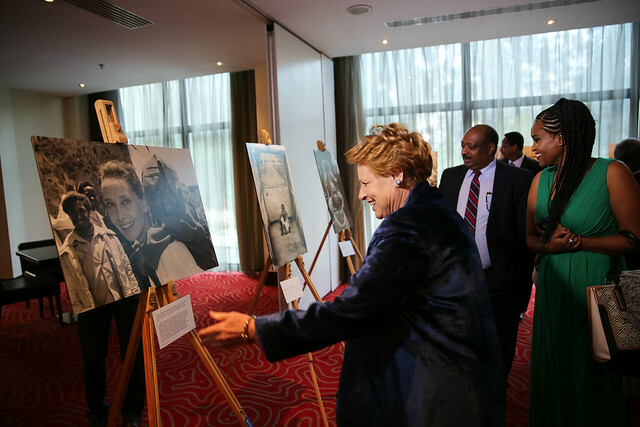 UNICEF’s 70th anniversary in Ethiopia was a moment to amplify children’s issues with partners and staff to reflect back on key results, accomplishments and challenges while re-affirming UNICEF’s commitment to continue being a leading advocate for every child. 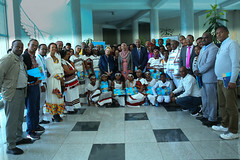 At a ceremony, moderated by UNICEF’s National Ambassador, Hannah Godefa, Minister of Women and Children’s Affairs and State Minister of Finance and Economic Cooperation along with celebrities and children launched a photo exhibition that depicts UNICEF’s presence in the country since the early 1950s. Marking the occasion, UNICEF Ethiopia staff released 70 blue balloons wishing for every child, everywhere, hope. 70 years of relentless work in the world’s toughest places to bring life-saving aid and long-term support to children whose lives and futures are endangered by conflict, crises, poverty, inequality and discrimination. UNICEF was established in 1946 by the United Nations to safeguard the lives of children struggling to survive in the aftermath of World War II – and in doing so, to help rebuild destroyed societies and restore hope for a better future. UNICEF was officially established in Ethiopia in 1952. However, UNICEF provided relief efforts to Ethiopians affected by war and drought as early as 1950. 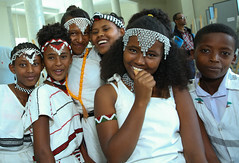 Over the last six decades, UNICEF has established close relations with the Government, bilateral donors, development partners and civil society in Ethiopia. Together with its partners, UNICEF has supported children and women both within humanitarian response and preparedness contexts as well as through contributing to long-term development agendas, including strengthening national systems. However, without courageous and committed people working to reach the most vulnerable children, and without government partners, donors, fearless advocates and supporters from around the world, we would never have achieved the immense progress for children which we have seen in recent decades. With the collaboration and support of partners, the number of children dying before their fifth birthday has more than halved in the past 25 years. Hundreds of millions of children have been lifted out of poverty. Globally, out-of-school rates among primary-school-aged children have reduced by more than 40 per cent between 1990 and 2014.
more recently, we were able since mid-July 2015 to successfully respond to the El-Niño driven drought emergency, treating more than 480,000 children for malnutrition. But, despite the impressive progress, many children are still being left behind. Globally, children are vulnerable because of their gender, race, religion, ethnic group or disability; because they live in poverty or in hard-to-reach communities; or simply because they are children. We must recommit ourselves to the goal of seeing all children treated fairly and living free from oppression. Sub-Saharan Africa is home to nearly three-quarters – 393 million – of the children living in countries affected by emergencies, followed by the Middle East and North Africa where another 12 per cent of these children reside. In northeastern Nigeria, nearly 1.8 million people are displaced, almost 1 million of them are children. Next door, in South Sudan, 59 per cent of primary-aged children are out of school and 1 in 3 schools are closed in conflict-affected areas. In Ethiopia, this year alone, an estimated 420,000 children were expected to require treatment for severe acute malnutrition due to the El-Niño driven drought. These figures are stark reminders of why UNICEF was established, as the organization marks 70 years of work for the most vulnerable children. From the ashes of war in the 1940s to the global migrant and refugee crisis today, and from providing relief assistance to drought-affected people to supporting the establishment of national systems such as birth registration, UNICEF has consistently protected and advocated for children at risk to make each child count. Seventy years on, we are working harder than ever to give a fair chance for every child. We look ahead, with hope and determination, to a better future for all the world’s children. 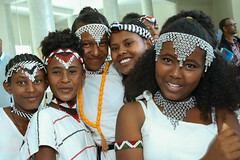 The theme for this year’s Day of the African Child – Conflict & Crisis: Protecting Children’s Rights – is a pertinent one. Conflict, fragility and insecurity are among the most significant development challenges of our time. Globally, more than 230 million children live in places fraught with conflict, fragility and instability. UNICEF estimates that nearly 90 million children under the age of 7 have spent their entire lives in conflict zones. Children living in conflict are often exposed to extreme trauma, putting them at risk of living in a state of toxic stress, a condition that inhibits brain cell connections – with significant life-long consequences to their cognitive, social and physical development. In addition to the immediate physical threats that children in crises face, they are also at risk of deep-rooted emotional scars. 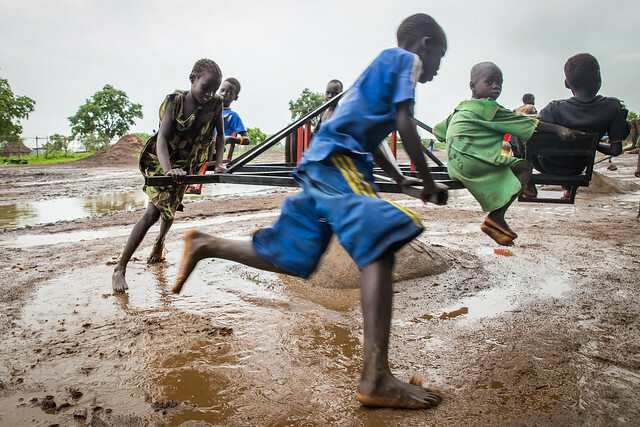 Conflict robs children of their safety, family and friends, play and routine. Yet these are all elements of childhood that give children the best possible chance of developing fully and learning effectively, enabling them to contribute to their economies and societies, and building strong and safe communities when they reach adulthood. As in all humanitarian crises, children continue to bear the brunt of the impact. It is estimated that three out of 10 African children are living in conflict-affected areas. Children do not start wars…. We know that. – Yet they are most vulnerable to their deadly effects. Armed conflict kills and maims children, disrupts their education, denies them access to essential health services, increases poverty, malnutrition and disease. Conflict can also separate children from their parents, or force them to flee their homes, witness atrocities or even perpetrate war crimes themselves. Children are always among the first affected by conflict, whether directly or indirectly. Armed conflict affects their lives in many ways, and even if they are not killed or injured, they can be orphaned, abducted, raped and left with deep emotional scars and trauma from direct exposure to violence or from dislocation, poverty, or the loss of loved ones. In addition to conflicts, Africa faces a huge burden of natural disasters and disease outbreaks – like Ebola, which have an equally heavy impact on children’s lives. Climate change is increasingly recognised as one of the biggest threats to children globally and in Africa. For example, the El Nino weather phenomenon, felt strongly here in Ethiopia, is exacerbating flooding and droughts, and worsening food crises across the Continent. Last year, UNICEF responded to 141 humanitarian situations of varying scale in sub-Saharan Africa. We are working with governments, partners and communities to ensure that children’s rights are protected even in the most difficult of situations. UNICEF is also continuing to invest in disaster-risk reduction, early preparedness and efforts to strengthen the resilience of children and their communities so that the impact of any future crises can be reduced. But of course, what we ultimately need is greater political will to end conflicts in Africa and to ensure that children’s rights are protected even during times of humanitarian crises. In preparation for this year’s Day of the African Child, UNICEF used an innovative messaging tool called U-Report to ask children if they think their leaders are doing enough to end conflicts and crises in Africa. The top message was that children don’t think that their leaders were doing enough. We also surveyed the children who participated in the pre-session and They came up with some very smart suggestions on what political leaders – including the Chairperson of the African Union – can do to stop conflict and crises in Africa. Today’s commemoration of the Day of the African Child is a critical step in galvanising political support for the protection of children’s rights during conflicts and crises, and for holding state and non-state actors accountable when rights are violated. So we must listen carefully to what the children today tell us. About how conflicts and crises are affecting their lives and what needs to be done to ensure their rights are fully realised. We know they have the answers. It is then our duty to share these messages with the people in power and push for action to be taken. In recent years, the global momentum on nutrition has been growing rapidly. The Scaling-Up Nutrition Movement has united world leaders and brought the UN, governments, civil society and the private sector together in a collective effort to improve nutrition through shared goals and resources to effectively scale up nutrition policies and programmes. Ethiopia’s continued reduction of extreme poverty and chronic malnutrition has received international recognition and continues to inspire the international community to remain ambitious in the level of progress it aims to achieve. 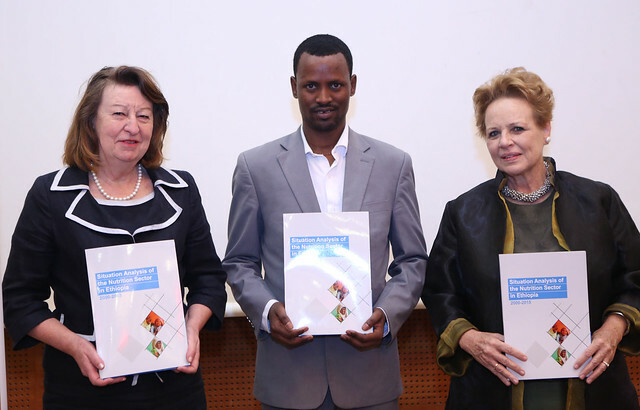 Today, 10 March 2016, a document entitled Situation Analysis of the Nutrition Sector in Ethiopia from 2000-2015 was launched which was made possible through funding provided by the European Union to UNICEF, as part of the EU+ Joint Cooperation Strategy for Ethiopia, which aims to ensure a coherent and consistent response to Ethiopia’s development challenges. As the world embarks on a new sustainable development agenda, the Government of Ethiopia and its development partners can look back on the 15 years of remarkable progress in the Nutrition sector through this Situation Analysis document that we are launching here today. The findings of the Situation Analysis provide evidence of a steady and substantial improvement in stunting over the last 15 years in Ethiopia where the stunting prevalence has dropped from 57 percent to 40 percent. At the same time, food consumption and expenditure have increased on average from about 2,200 calories per household per day in the year 2000 to 2,450 calories per household per day in 2011. UNICEF applauds the achievements made and the strong commitment of the Government of Ethiopia to improve the nutritional status among children and women, encouraging continued development and expansion of policies and programmes for nutrition interventions. However, there is still a long way to go and the eradication of undernutrition among children and women will require multi-sectoral efforts to ensure a more equitable and sustainable impact. The report highlights critical gaps in terms of existing policies and programmes which we must address urgently to accelerate nutrition results for women and children. Some of the key findings of the situation analysis report includes; educating mothers as key factor for improving nutrition, high risk factors for child stunting associated with poor water supply and sanitation and the need to improve production diversity, nutrition knowledge and women’s’ empowerment by making sure that diverse and nutritious foods are available and accessible at all times. In addition, the study highlights the need to expand existing nutrition programmes to improve undernutrition in the Developing Regional States (DRS) with increased resources and improved targeting. These findings from the situation analysis will be key to inform programming for a wide range of nutrition specific and nutrition-sensitive stakeholders in Ethiopia. The findings will feed into the second National Nutrition Programme (2015-2020), which targets to reduce child stunting prevalence to 26 percent by 2020, as well as the second Agricultural Growth Programme which strives to increase agricultural productivity with a ‘nutrition lens’. The recommendations in the situation analysis will help support the Government in the realisation of the Growth and Transformation Plan 2 and the achievement of the Seqota Declaration to make undernutrition, in particular child undernutrition, a history in Ethiopia. Malnutrition is one of the greatest symptoms of injustice and inequality that we are fighting in Ethiopia today. By accelerating our joint nutrition interventions, we can transform the lives of millions of children to become healthy citizens and reach their full potential with their hopes and opportunities restored. 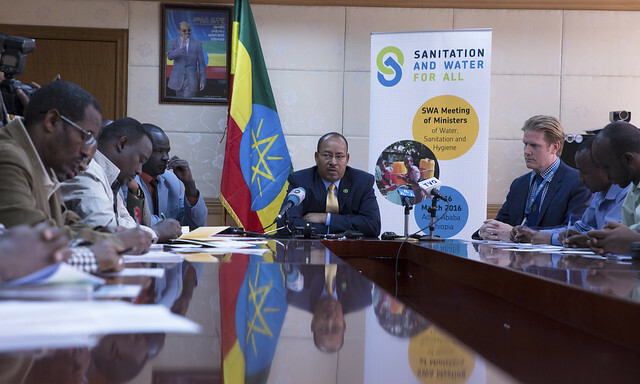 Ministers of Water, Sanitation and Hygiene from around the world will meet in Ethiopia from 15-16 March 2016 to plan and prepare for the implementation of the Sustainable Development Goals (SDGs) related to sanitation, water and hygiene. The meeting is organized by the Sanitation and Water for All partnership (SWA), and convened by UNICEF. SWA has over 100 partners, mostly governments, and works as a platform for encouraging and coordinating political dialogue and action around water, sanitation and hygiene issues. “This meeting will be different from all other high level meetings organized by SWA previously, mostly because of the timing: it will be the first global meeting on these topics after the UN Member States agreed on the Sustainable Development Goals last September, “says Motuma Mukassa, Minister of Water, Irrigation and Electricity of Ethiopia. Mr Motuma also underscores that the SDG targets on water and sanitation requires a higher level of coordination, alignment and communication both at global and national levels. Ethiopia is selected to host this meeting for its commitment to implementing innovative ways towards achieving universal access to sanitation, water and hygiene by coordinating different ministries, increasing sector funding and investing in the training of health workers. The country’s One WASH National Progrmame (OWNP), launched in September 2013, is one of the most ambitious in the sector. It is based on a sector-wide approach and involves the ministries of water, health, education and finance and the government’s main development partners. Ethiopia devises this programme to modernize the way water and sanitation services are delivered to its people. Recently, with UNICEF’s support, Ethiopia also started a South-South collaboration with Brazil in the area of urban sanitation and regulatory framework for WASH service delivery. The Ministerial Meeting is a unique opportunity for countries to identify the major bottlenecks to achieving the SDG water, sanitation, and hygiene targets and lay groundwork for clear action plans, strategies and milestones. High-level delegates, including the Prime Minister of Ethiopia, Hailemariam Desalegn, Kevin Rudd, Chair of SWA and the 26th Prime Minister of Australia and Anthony Lake, Executive Director of UNICEF will attend the meeting. 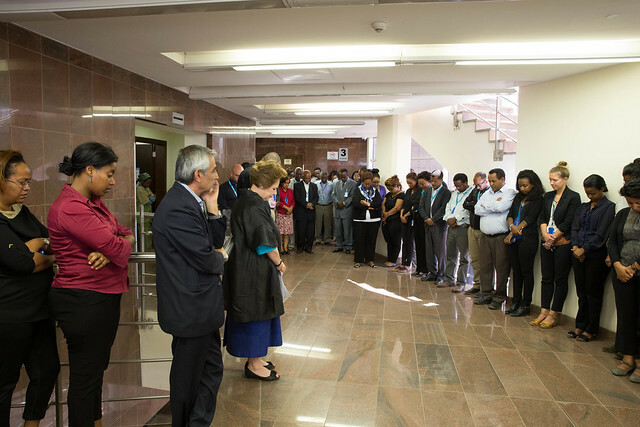 UNICEF Ethiopia staff gather to dedicate a minute of silence to colleagues who tragically lost their lives in Somalia and Ethiopians killed in Libya and South Africa. 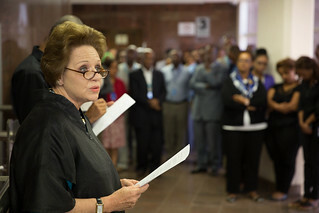 Below is UNICEF Representative to Ethiopia, Gillian Mellsop’s message during the occasion. 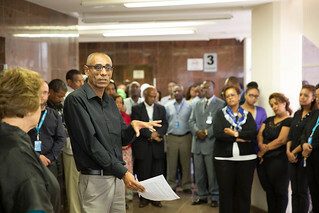 “It is with great sorrow that I’ve asked you join me and reflect together on what has happened to our UNICEF colleagues, other UN staff and fellow Ethiopians during the last couple of days. By now I believe you have been informed about the loss of four of our colleagues, killed yesterday in an attack on a vehicle in which they were riding in Garowe, Somalia. In addition, four other colleagues have been critically injured. The IED (improvised explosive device) attack occurred when the staff were travelling from their guest house to the office, normally a three minute drive…. The horrific attack on our UNICEF colleagues is an assault not only on them but on the people, the women and children they served. This tragic loss again underlines the bravery of our staff across the globe and also the risks we face in the most difficult locations where we work, including in Ethiopia. Our immediate thoughts are with the families of the staff members who were killed and with those who were injured. Our colleagues dedicated their lives to working for the children of Somalia. We are here together this morning, to mourn their loss and hope for the full recovery of the injured. I know many of us have friends and colleagues working in Somalia and some of us may know the victims personally – which makes our pain even more profound. Colleagues, It has been a week of shock and sadness for many. Last week, an Ethiopian national was killed during the xenophobic or ‘afrophobia’ attacks which went rampant in Durban, South Africa. People across the world have also been shocked by the atrocious massacre of some 30 Ethiopian Christian migrants by Islamic State in Libya. Let us each dedicate a few minutes this morning to think and pray for our colleagues in Somalia; those who lost their lives in the xenophobic attacks; and the brutal killing in Libya – and think about their children, husbands, wives, parents and friends they left behind. Colleagues, let me reassure you, we are condemning these atrocities, not because those killed are Ethiopian or our colleagues. We – as individuals cannot allow harming or killing of the innocent, regardless gender, nationality, race or religion. Awoke Moges, Chair Person, UNICEF Eastern and Southern Africa staff association added “This week will be one of the darkest period for UNICEF family, and Ethiopians families and friends who lost their beloved ones. Our thoughts goes with all of them.